"Twenty Tulsa-area parents are suing Broken Arrow, Union, Jenks and Tulsa public school districts for refusing to provide scholarships to their special needs children to attend private schools," the Tulsa World reports. Eric Rassbach, the Becket Fund's national litigation director, said, "These school districts put the 'heartless' in 'heartless bureaucrat.' What kind of public servant holds special needs kids hostage to shore up the school district budget? Are these children supposed to be bullied every day so Jenks Public Schools can hold on to a few extra dollars?" For more on heartless Tulsa-area bureaucrats, click here. "Republican governors and lawmakers are pushing for a major expansion of voucher programs," Education Week reports. Senate Bill 969 by Sen. Dan Newberry (R-Tulsa) and Rep. Lee Denney (R-Cushing) cleared the Oklahoma House of Representatives this morning by a vote of 64-33. The bill had already cleared the state Senate, and now will make one more pass through the Senate before it goes to Governor Mary Fallin's desk. Under this legislation, which is modeled after successful programs in Pennsylvania and Arizona, Oklahoma businesses and individuals can qualify for tax credits for contributions made to scholarship-granting organizations. These philanthropic organizations, in turn, offer private-school scholarships to qualifying students in need, special-needs students, and others. (Contributions can also be made to support innovative programs in public schools.) This scholarship tax credit idea is popular with Oklahoma voters, is supported by state Superintendent Janet Barresi, and was given a thumbs-up this month by the Supreme Court of the United States. There is every reason to be optimistic that Gov. Fallin will sign the bill into law. "Call me old fashioned," Andrew J. Coulson writes, "but I prefer to reach policy conclusions based on empirical research." So after comparing the performance of alternative school systems over the past 2,000 years, I surveyed the modern econometric literature on the subject for the Journal of School Choice. 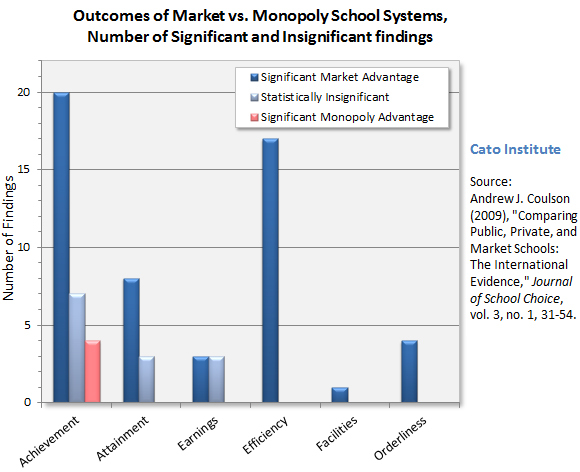 What I found is that the freest, most market-like education systems consistently outperform the sorts of state monopolies preferred by [teacher union leader] Ms. Weingarten and her fellow travelers. 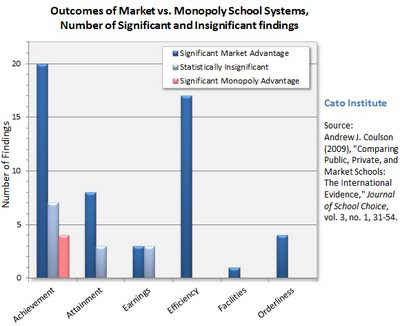 Appended below is the chart counting up how many studies favored education markets over state school monopolies, and vice-versa, in each of six outcome areas. That's how many of Oklahoma's black 4th graders can read at a proficient level. Not high-school seniors, and not school vouchers, but still. Carrie Lukas says they're "the future of school choice," but Adam Schaeffer says beware. UPDATE: Matt Ladner weighs in, as does Andrew J. Coulson. ... from the Tea Party. Says Katrina Trinko in USA Today. More than 7,500 essays were submitted in the first annual "Stossel in the Classroom" essay contest. The topic: What's great about America? The winner: homeschooler Philip Wegmann. "I'm urging passage of legislation enacting tuition tax credits in Oklahoma to offer parents more and better choices," state Superintendent Janet Barresi writes in the Edmond Sun ('Bold reforms will transform state's education system'). "Under the legislation, businesses and individuals could qualify for tax credits for contributions to eligible scholarship-granting organizations. Those organizations, in turn, would offer scholarships to qualifying families in need." The legislation, Senate Bill 969, is currently making its way through the state legislature. Arizona has adopted Education Savings Accounts for special-needs students. Our friends at the Foundation for Educational Choice say this new law is unprecedented, and Matt Ladner says ESAs could be the way of the future. Adam Emerson on some left-right convergence. Chairman Kline and Honorable Members of the Committee on Education and the Workforce, I am pleased to offer testimony today on education reforms and to address how I believe we can better promote flexibility and innovation. I took office in January amid a bipartisan groundswell of support in Oklahoma for education reform. Most Oklahomans recognize we’re in crisis in education in our state. In March, we learned that nearly 43 percent of first-time freshmen who entered Oklahoma’s public colleges in the fall of 2009 were not prepared for college. In January, results from the 2009 National Assessment of Educational Progress showed that 72 percent of Oklahoma fourth-graders taking the test and 75 percent of eighth-graders taking the test fell below “proficient” in science. And research by Stanford economist Eric Hanushek that compared top-performing math students all over the world showed that Oklahoma ranked far down on the list near developing or struggling nations like Bulgaria, Chile and Thailand. These results are like a dash of cold water. We understand mediocre doesn’t cut it anymore, and we’re taking action. Just three weeks ago, I launched the 3R Agenda — a commitment to new fundamentals for the 21st century. The new 3Rs for our state’s future are: Rethink, Restructure and Reform. RETHINK is a complete reassessment of how we’re delivering education to empower parents, children and teachers, and to embrace new tools like digital learning. RESTRUCTURE involves a transformation of Oklahoma’s State Department of Education. I'll focus more on the third ‘R’ — REFORM — because it is the primary reason I am here today. We’re now at the halfway point in our State Legislature’s annual legislative session, and significant progress has been made on a number of reform bills. It appears we will implement a grading system for schools and school districts — an annual A through F report card just like students receive, so that parents can determine how a school is performing without having to interpret obscure or confusing metrics. We will also likely end social promotion after the third grade — so students aren’t entering their most critical learning years unprepared. And I am urging passage of legislation enacting tuition tax credits in Oklahoma to offer parents more and better choices. Under the legislation, business and individuals could qualify for tax credits for contributions to eligible scholarship-granting organizations, and those organizations, in turn, would offer scholarships to qualifying families in need. But just as we embark on legislative implementation of the 3R Agenda, we are mindful of potential obstacles if the federal government is too inflexible. I am also hopeful that, while policymakers debate the reauthorization of No Child Left Behind, reformers will follow the lead of states like Oklahoma. Under the current implementation of No Child Left Behind, the Adequate Yearly Progress yardstick evaluation is rudimentary and does not provide meaningful information to parents. But most importantly, it does not recognize the ultimate goal of college and career ready status for all students facing the 21st century workplace. By contrast, Oklahoma’s new A through F school report card system will offer easy-to-understand results for parents, and it is based on a number of different measurements that incorporate gains and improvement. Another example: As Oklahoma seeks to end social promotion after the 3rd grade, many districts would like to fund portions of this effort with federal funds. But it appears this would not be possible currently because of federal restrictions on supplementing versus supplanting. This demonstrates the ways in which entrenched federal guidelines present some barriers to innovative state policies. On the one hand, the U.S. Department of Education has issued guidelines that on the surface seem to offer states more flexibility to meet local needs. But there seems to be a disconnect between good intentions at the top level and what actually occurs in practice. And let’s consider the simple reform of tuition tax credits. Federal law offers parents in low-performing schools the opportunity to transfer to another public school. This isn’t true choice. Oklahoma’s reforms will offer parents an array of more choices — rather than only the option of transferring from one public school to another. I urge reforms that follow this same pathway by incentivizing states to provide an array of options for students. As all participating states prepare to transition to Common Core curriculum standards, more flexibility is also needed in the use of federal funds for professional development that would support effective instructional practices. 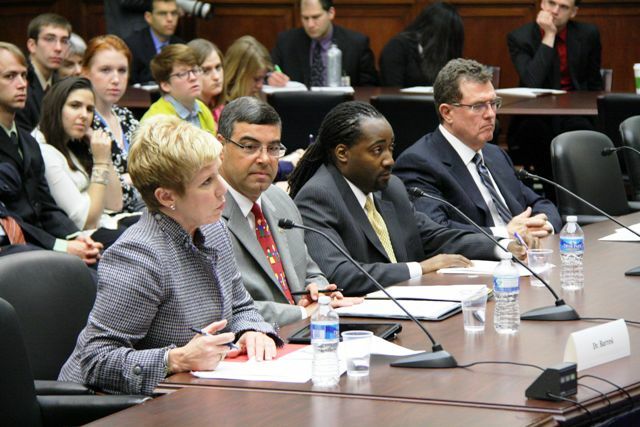 Additionally, broadening the scope of the designation of Title programs to include a wider array of subject matter, such as STEM initiatives, would help enable states to offer a more challenging curriculum. Mr. Chairman and honorable members of the committee, the bottom line is this: we can turn our crisis in Oklahoma into an opportunity, but only if we are prepared to embrace the kinds of bold reforms that fundamentally transform our education system for the better — and only if the federal government is prepared to work with states like ours to allow the flexibility we need in order to innovate. On March 15 in Oklahoma City, the past met the future. Carrying signs that read "Stop the War on Workers," "Collective Bargaining: Backbone of the Middle Class," and "Don't Dismantle Public Education," hundreds of Oklahoma schoolteachers rallied at the state Capitol. They expressed concern over school spending, pension reforms, and legislation making it easier to fire bad teachers. In many ways it was a scene right out of 1990, or even 1960. For many of these educators, "public education" still means, essentially, a government monopoly wherein kids are bureaucratically assigned based on geography. After all, isn't that the way we've always done it? Indeed Arne Duncan, President Obama's secretary of education, recently lamented that "our K-12 system largely still adheres to the century-old, industrial-age factory model of education." But that's the wrong model for the information age. And the one Oklahoman who understands this better than anyone also made news on March 15. That's the day state Superintendent Janet Barresi unveiled a forward-looking education agenda, a "road map for long-term transformation." Like Duncan, who urges "a fundamental rethinking of the structure and delivery of education in the United States," Barresi says "we must rethink our entire approach to education in the 21st century and buck the status quo." Why? Well, unlike one state senator from Little Dixie who believes "our public schools are doing a great job in educating our students," Barresi understands "we face a crisis in education in our state." "Our children don't have time for antiquated approaches," she says. That's why she's promoting ideas like greater accountability, an end to social promotion, a transparent A-through-F grading system for schools, and more school choice (including tuition tax credits, which, incidentally, cleared the state Senate the next day). Moreover, she says, "We have only scratched the surface of the potential for digital learning to fundamentally alter education." Visit KhanAcademy.org and you'll see why some public school fifth-grade classes are doing math this way. Experience great teachers like historian J. Rufus Fears on DVD. Explore the Stanford and MIT courses available online for free. In 2011 why would any parents—from Little Dixie to the Panhandle—settle for anything less than a world-class education for their children? No, ralliers, public education is not being "dismantled." It is, however, being redefined. Put simply, "public education" means "educating the public." Pennsylvania state Sen. Anthony H. Williams, a liberal black Democrat, puts it this way: "An innovative and productive public education system can include homeschooling, parochial schools, private schools, cyber schools, public charter schools and, yes, traditional public schools." Williams has no patience for folks who seem "more concerned with propping up a system than educating children. They cling to the antiquated belief that existing public school systems have the right of first refusal when it comes to educating our children." They don't. So remember March 15, 2011. And to those educators and policymakers stuck in the past: Beware the march of ideas. Homeschool mom Jennifer King of Newcastle has been selected as the 2011 "Oklahoma Young Mother of the Year" by the Oklahoma chapter of American Mothers, Inc.
"One of the most straightforward ways school districts can obtain cost savings without harming students," writes Harvard professor Paul E. Peterson, "is to eliminate extra pay for teachers who earn a master’s degree." Cato has the details here, and I'll be on KTOK tomorrow morning at 7:35 to discuss it with Reid Mullins. 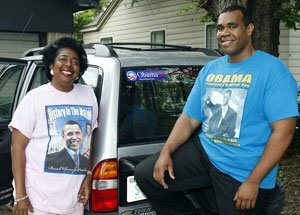 The new chairman of the Tulsa County Democratic Party, Judy Eason McIntyre (pictured above at left), supports school choice. At Thelma Parks Elementary School in Oklahoma City, a student tied a preschooler to a pole and covered his mouth with duct tape. Not sure where the teacher was. And in Wisconsin, a Head Start employee has been charged with making death threats against Republican legislators.